L. Suzanne Hickey View Condolences - Whitby, Ontario | Barnes Memorial Funeral Home Ltd. I am so sorry for your loss and send my deepest condolences. I remember well your family visit to Calgary and area and to my ranch for a lovely family visit. Love and prayers from one of your western cousins. I know that my brother Paul and Mary, my sisters Cathy and Karen and son Michael attended today to support you. Take care. Dorothy, Christopher, Jamie and I send you, Laura and Jennifer our deepest sympathies. Thank care and out thoughts and prayers are with all of you. Condolence: May you treasure all the wonderfull times you had together and my prayers are with you and your whole family. We are all very sorry for your loss. Sue was truly an amazing woman. Her friendship was beyond words. I will miss our talks and outings. Sue will be dearly missed as she left an imprint that was undeniably sincere and caring. Our love goes out to you during this difficult time. Our most sincere and heart felt condolences. We are so sorry for your loss and share your grief. Michael, you have lost the love of your life, your partner in life; Laura and Jennifer, your devoted and loving mother. Her love for you was endless. Sue was all these things and more to everyone who knew her. Her beautiful, shining spirit touched everyone and everything. She was a devoted and caring daughter to her aged parents. Sue was not only a generous, giving and loving sister to her siblings, but our best friend. She always shared our joys and sorrows, ready to give us a shoulder to cry on. She was a kind and gentle Auntie to her nieces and nephews. Loving them unconditionally. She so enjoyed the sharing of photos, videos and stories of her newest great niece, Ellie. She shared the joy of Ellie’s arrival loved being part of Ellie’s growth and development with us. Sue always cherished babies and children. She had a special affinity with them and they felt drawn to her. She was a loyal friend, always there to lean on for support or to lend a helping hand. 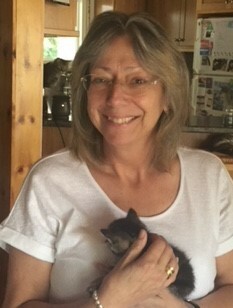 She was a gentle and caring surrogate mother to all dogs, cats, squirrels and birds. Her furry friends. Her beautiful spirit was so bright, it drew all to her. She received so much joy in giving and her beautiful smile shone bright and said it all. She will be sorely missed. Sue, we love you always and forever. My sincerest condolences to you all. Sue was such a beautiful person inside and out every time I met her! Your very sad loss will be felt by so many others whose lives she so lovingly touched. God Bless you all.